This time an extension that is a bit different compared to what I have done before. When the album enters the local library it will show up in Roon as normally. 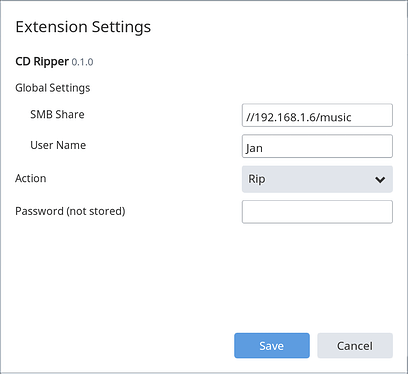 There is no longer a need to startup a separate PC, rip the CD and adjust the metadata. 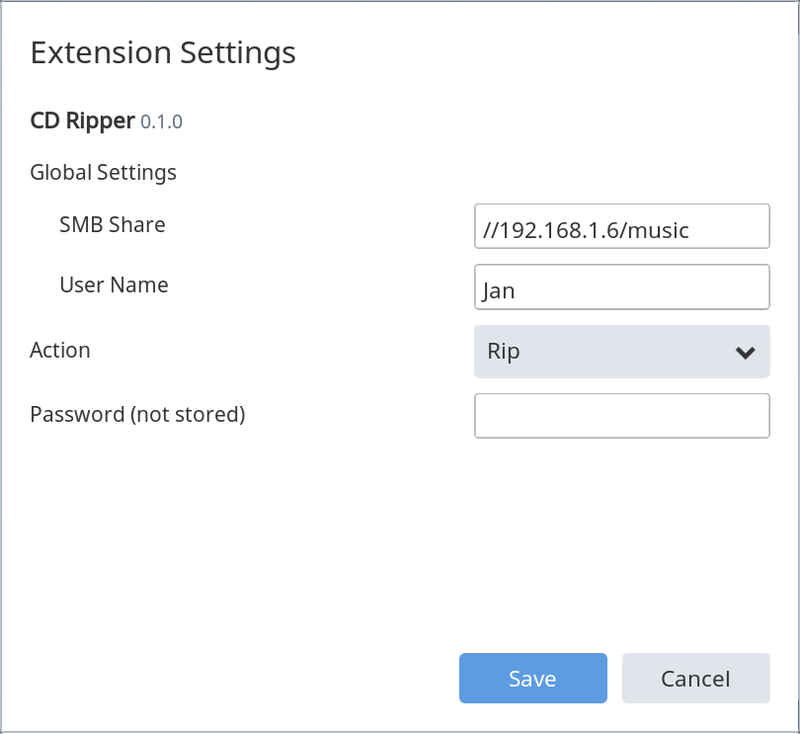 Installing the CD Ripper extension requires version 0.10.0 (or higher) of the Extension Manager combined with a Docker installation. When this is available the CD Ripper can be found in the Tools category. During installation the device path of the optical drive should be supplied in the Docker Install Options. 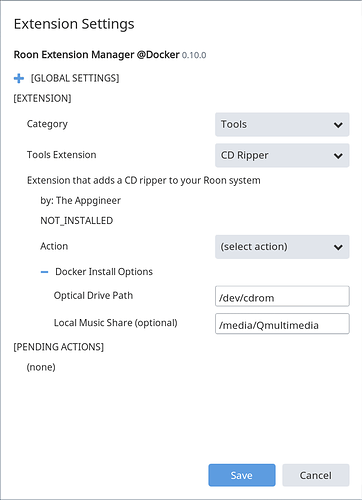 If the local Roon library is on the same device as where the extension is running and it cannot be accessed as a Samba Share, then this local path has to be supplied as well. This makes the local Roon library available to the container where the extension is running in. 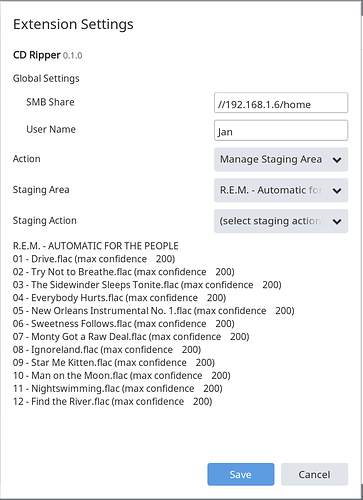 An action is started by selection one from the dropdown list and pressing the Save button. Status messages are displayed in the Extension overview beneath the CD Ripper entry. The setup I’m using consists out of an external DVD drive and a NUC, the NUC also runs my Roon core. Before pushing rips directly into your Music Library it might be wise to try a push into a test directory first. 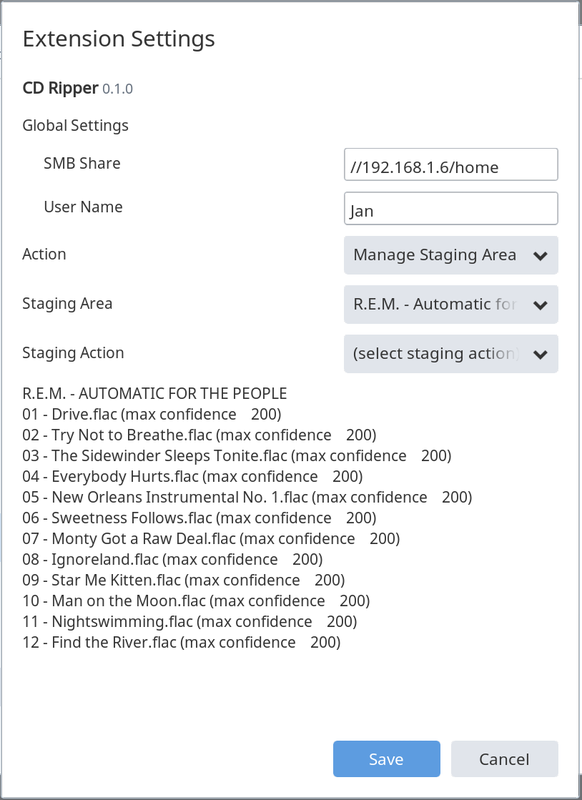 Make regular backups of your Music Library and Roon database. That’d be a cool thing. I guess I don’t see the point, when tools like ExactAudioCopy already exist and have fully auto modes if the user wants (insert disc - it auto-identifies and sets track names/etc, rips, ejects disc, user inserts next disc). Having EAC spit to a mountpoint already monitored by Roon means Roon will also auto-import the tracks due to Roon’s filesystem watcher. Why reinvent the wheel, when the wheel already has years of development and refinement built into it? Having EAC spit to a mountpoint already monitored by Roon means Roon will also auto-import the tracks due to Roon’s filesystem watcher. It’s better to rip to a folder that is not watched by Roon and then copy the files over to a watched folder all at once. Due to the length of time taken to rip a complete CD, there are reports that Roon can get a little confused when it sees tracks arriving very slowly and the results in identifying albums is better when the files are all copied across at once. Always good to have different options, and… why not? A great idea!! The available software like this for Mac is somewhat limited. Would really appreciate this extension. Although I left some room for doubts, this is not an April fools joke! Why reinvent the wheel, when the wheel already has years of development and refinement built into it? This is not about reinventing the wheel, more about integrating the wheel. For the heavy lifting I’m using Whipper. 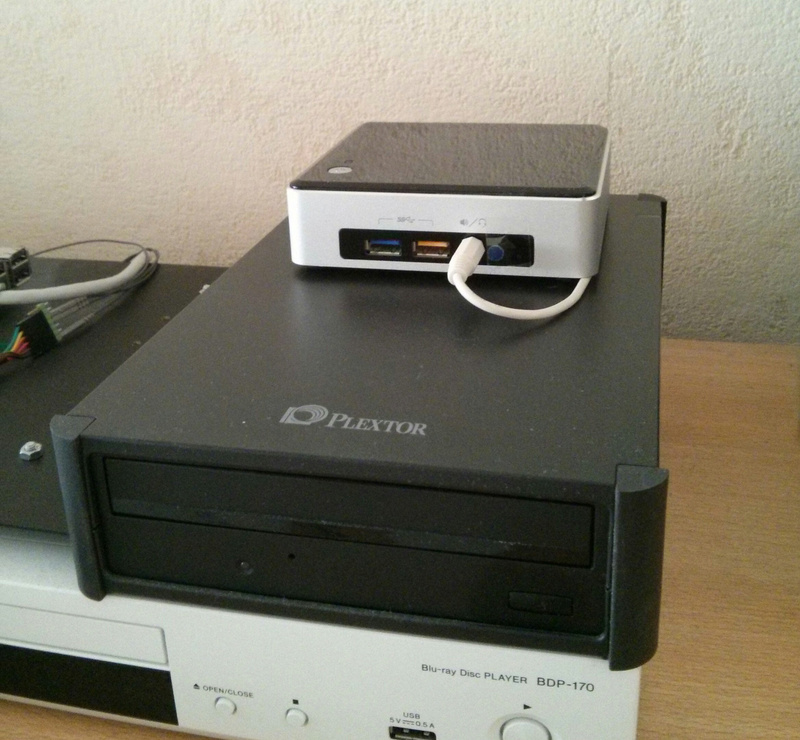 The typical use case is running Roon Server on a headless system and using this system also for the ripping of CDs. This will be Linux only. 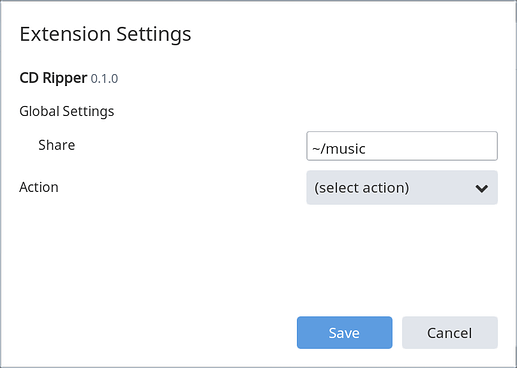 Not only due to the underlying tool but also because it requires Docker to have it distributable via the Extension Manager. I don’t know yet if this will run on ARM. Very interested in this. It would pretty much complete Roon for me. So can I run it on its own, does it need to be runnig on the same machine as the core? It can run on a different machine as long as it can temporarily store the ripped album and it has direct access to the optical drive. Cool the drive would be on the same machine as the extension. will this be available in extension manager when its ready? The available software like this for Mac is somewhat limited. It’s looking like @Jan_Koudijs is only going to make this available on a Linux platform. Have you tried XLD for Mac @Anthro? I use it and it performs basically the same function, including checking the AccurateRip database and encodes to any file type you want. Not everybody is computer literate. The idea that somebody who might choose a Roon Nucleus for convenience and simplicity, can now plug an external drive in to rip their collection is a great idea and I applaud the OP. I’m afraid that will not be possible due to the limitation of the operating system. Convenience and simplicity come at it’s price. I realized Mac users were bummed out a few minutes later, such a shame. I am familiar with XLD, it’s my current ripper of choice. But something Roon integrated would have been nice. Yes, that’s the plan, but remember that you should have Docker installed in order to use it. @Jan_Koudijs any ideas when this will be ready to test in the wild?